Something() // does something else without the use of `new`. // an ES6 pool class. let pool = null // to contain a single pool, in the module scope. // give the class to the user. pool.get(this).instances.shift() // recycling is full, empty some out first. pool.get(this).instances.push(trashItem) // put the new item in the bin. Pool.threshold = 100 // maximum size of the pool. // create the pool during module load, before app code (before the UI) runs. // Some possible way to use the pool. let chocolateBar = this.super() // returns an instance, which is a reference to the new object created by the super constructor call. this.flavor = "milk chocolate caramel"
@gadicc and @joe, I think "classical inheritance" is not where we should head when we can and should be looking into breaking out of that thinking and moving to "Prototypal OO". I don't think we should be trying to create a factory by using the class. Let's just do it the way it should be done using closures and prototypical inheritance if we are going to do it at all. Some of the Willyboat devs tried to introduce it, but it needed to be adopted from the base code to really work well and create a good API. But this does not mean we abandon ES6. We only abandon ES6 class! We can and should expose these methods to the consumers of the library (API) when it will benefit them. I think "classical inheritance" is not where we should head when we can and should be looking into breaking out of that thinking and moving to "Prototypal OO"
we may as well write that in ES6 (when it's native), since it's basically the same thing. I don't think we should entirely abandon ES6 class, as it's a much beter and readable syntax for the same thing (with very minor implementation details, and suitable in most cases). and not use the new keyword at all. We can totally do that, and it would be easy to read. We definitely don't have to use classes for everything, but when we do, the class cases should be as readable and clear as possible. It's cool we have the ability to use-new-or-not, but IMO that doesn't mean it's better. Let's make our code base easy to understand right away, so that completely new programmers and advanced programmers alike can get started with our libs quickly. Let's keep all of our options open. I think classes make sense for lots of things, but not necessarily everything (although we can implement everything in classes if we wanted to). Bottom line: Let's write easy-to-read, well-documented, simple code. Yes, but that was just me showing the problem with going down that road of a bad pattern. // --------------- Component.js - a concatenative class? // No constructor here, so it'll have a default one, the same as in ES6. }, 'flat') // a la crockford. Object.assign(classBody, superClassBody) // simple concatenation. // a body stored for each constructor (since we're not using prototypes). classBody.constructor.body = classBody // for convenience to the user. Component.body.someMethod.call(this) // call the super method (despite having no prototypes). // We have the classical pattern, but implemented with concatenation! I'm really liking this idea. We've just eliminated prototype lag in Components (which will be updating at 60fps). Concatenative classes will give us the most performance (we simply provide a comvenience though an API (like my Class().extends()) so that users can still do Classical OOP). @talves By the way, in that article you linked, they use Backbone as an example while describing their debugging problem. That's not Classical OOP's fault, that's Backbone fault. Backbone's constructor pattern is flawed, convoluted, and fails at one basic thing: naming constructors. They'd have had much better time actually using ES6 classes. So, the article is flawed in the sense that it's describing ES6 classes using a flawed ES5 pattern. They are only half correct about having to search up the prototype inheritance, but trust me, debugging Backbone isn't pleasant. Part of the problem (as he alluded to) also lies in the fact that the team had bad programming practices (working around bugs of a super class in a child class instead of just fixing the problem at the root (and that probably means a lack of proper testing)). But hey, if we use the concatenative approach (which I'm totally down to do) then we've eliminated some room for poor practices! I'm so down. I'm going to update lowclass after Tuesday. I must now disappear until then. All this being said, I still have to do all the performance testing of any pattern proposed! At first glance, the use of 'new' seems to be much faster 4x. Yeah, I'm gonna implement the concatenative feature in lowclass soon and benchmark it. What were you comparing it against? What do you guys think about the idea of concatenation-based classes, but with a classical way of writing them? I really like the idea of writing classes using a single syntax/API, yet having the ability to specify what type of classes they are (easy to modify later if needs change). The key is to look at extending (inheritance) performance most of all. 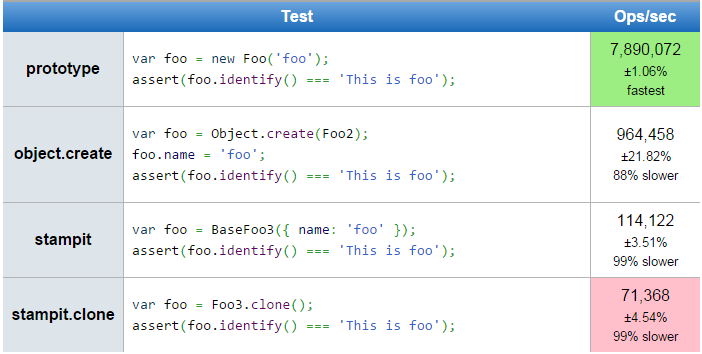 There really is a huge hit using class and extends over Object.assign where one level is 50% slower in my first tests. Oh, sorry. I compared it against Object.create(). Yes. We could use a library like Stampit to do this. It is an awesome library and follows a standard pattern. More benchmarking! OK Discourse, you are right! Very important to me! Ok, here is a jsperf test (only chrome) using the following methods. Unless I did something really wrong here, Stampit has some crazy problems with instantiation performance. I even threw in a clone factory to see if it would perform better. Nope, worse, but it should be the way the clone is just another wrap of a stampit call. Elliot, the creator of Stampit speaks to the use of Object.create not being faster in this issue. Not sure I agree with him 100% on everything he is saying. There really is a huge hit using class and extends over Object.assign where one level is 50% slower in my first tests. Exactly, that's what the concatenative approach solves. Although we might say something like Class ('Foo') .extends ('Bar') with lowclass, behind the scenes the extending is done with Object.assign to create a single-level object with no prototypes. We could use a library like Stampit to do this. That already looks too heavyweight. It's going to definitely have closures around your code in order to implement things like "private" and "protected" properties, and each level of that will incur memory and CPU usage. And then we'll be allowing devs to write code that doesn't translate to pure ES5 or ES6 classes. That already looks too heavyweight. It's going to definitely have closures around your code in order to implement things like "private" and "protected" properties, and each level of that will incur memory and CPU usage. Yep closures. What did you have in mind to use? Are you planning to do it without closures? Memory and CPU usage are not determined by closures as much as the incorrect use of them. A well written library is going to help build away from those issues. And then we'll be allowing devs to write code that doesn't translate to pure ES5 or ES6 classes. Please elaborate, I am not sure I know what you mean. I have not gone through lowclass, but will take a look. The concatenative implementation isn't there yet, I'll add it soon. The only bad performance hit that it has is during class definition, with the use of Object.getOwnPropertyDescriptor and Object.defineProperty, which is a little heavier than direct assignment, but other than that it just uses the constructor pattern with no closures, so it's exactly like writing the constructor pattern manually. BTW, stampit supports and builds on concatenative inheritance. each instance will contain new definitions of the same methods, defined during construction rather than on the prototype. It's nice what benefits we get in terms of "private" vars, but with the huge expense of memory. Stampit has some crazy problems with instantiation performance. let privates = new WeakMap() // keys in the WeakMap must be Objects. // private properties are stored in the weakmap. What that would do is just mix Bar and Baz onto the new class' prototype before finally mixing in the supplied body literal onto the new class' prototype created from Lorem. The interesting thing about WeakMaps and private vars would be that when you mixin different classes defined in different modules, each class would have it's own private collection, which may not behave as intended. // not the same `foo`! // output shows "foo" and "bar". It's per-instance privates, but on each level of the class hierarchy. We could fix this problem by storing a reference to some hierarchy-wide WeakMap in a separate module and importing it, if that's what we want, which would be like "protected" members in Java. @talves I'm not claiming that this classical pattern with private variables in WeakMaps is better, but just putting it out there so we can weigh our options. I'm just jotting down ideas. Here's a thought: if we store a single WeakMap in some module, and import it into every class, that'd essentially be like "private" members for the top-level object of every instance anywhere in an app that uses such a library, except that a user could also import that WeakMap reference and get the "privates" of any object, but it just might be better than prefixing local proeprties with underscores (f.e. this._somePrivateProperty). A use would need to import the WeakMap, then privates.get(someInstance).somePrivateProperty which is at least a little more warning-ful that danger may ensue from messing with the privates. What can we gleen from that? This: "protected members" are still not possible in ES6 without leaking information to the user. Okay, less writing, more coding! I'm going to make my prototype using mostly classical OO (using concatenative classes wherever possible, falling back to constructor pattern prototypes as minimally as possible or when memory is exhausted), with optional mixins/compositions. There is a solution for prototype assignments of methods to make sure you are not using the methods over and over for each instance. It is also very easy to do, once you understand how it works. It is covered in the advanced examples. I was always a proponent of classical until the last few months digging deep into the real benefits of prototypal OO. I understand you being opinionated about it, BUT there is really no reason to do a mix of the two in my opnion . I think there is really no advantage to chaining classes using a constructor method. I know Sometimes statements I make, I wish I would have stated that it was just an idea. FYI .enclose() is deprecated and is now .init() in Stampit now. I am going to make my design with Prototypal OO, because I know I can easily create a parallel library using classical later and benchmark an app using each. Still using ES6 and taking advantage of modules. Babel also supports JSX format, and you can plug in different backends to it. ie: use JSX to build render trees, even without needing to use react. @AdrianRossouw I love react for building render trees. I read somewhere (but forgot where) that we can make alternate rendering backends for React, so instead of rendering DOM, we can render just a scene graph.